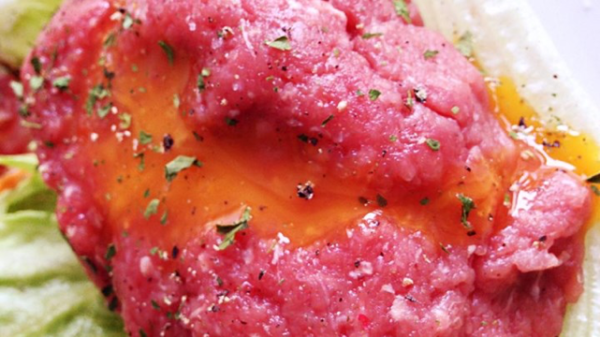 A Beef Tartare Dish isn’t a recipe that one might make for dinner every night of the week but, if you are a connoisseur of Italian Cuisine and are looking for something rich in flavor and will excite the taste buds then you will definitely want to give this recipe a try! In a bowl, mix Ground Beef, Hot Sauce, Mustard, Worchestershire Sauce, Salt, Pepper and Egg very well until all ingredients are completely combined. On a platter, place the beef mixture toward the middle of the platter or whichever design you would like to present to your guests. Cover the Beef with Foil and place in the refrigerator for at least 30 minutes. When the time is up, the Beef Tartare us best when served with garlic toast or even crackers as a dip! No Replies to "Beef Tartare"